Operation Hawk was the Canadian code word for the Korean airlift. At 1400 hours on 25 July 1950, North Stars 17502, 17504, 17507, 17511, 17514 and 17517 (each sporting a freshly stencilled UN flag on its tailfin) were loaded, checked and lined up in front of the squadron hangars in two rows. The entire squadron was on parade for a final inspection, the flight crews and technicians in front of their aircraft, facing more than 500 family members and friends. With the parting words of, "good luck, Godspeed and happy landings," from Air Vice Marshal A.L. James, the RCAF contribution to the Korean war airlift was underway. OpHAWK would continue until 31 May 54, and entailed 599 missions; a weekly shuttle with a capacity estimated at 10,000lbs of cargo each way, with an average elapsed time of 81 hours. Based from McChord AFB near Tacoma, Washington, with several stop-overs, including Shemya AFB on the western tip of the Aleutian island chain. This air field in the Bering Sea was notorious for the mist and foul weather that surrounded it, and it was there on 27 Dec 53 that NS17505 skidded off the side of the runway and down a steep slope. The North Star was a write-off, but happily the crew were fine. Haneda AFB was the Japanese destination for the missions, from which troops and cargo were then ferried into Korea. Totals included 6,000,000 statute miles flown, 13,000 personnel carried, 7,000,000lbs of freight carried, and 34,000 hours flown. 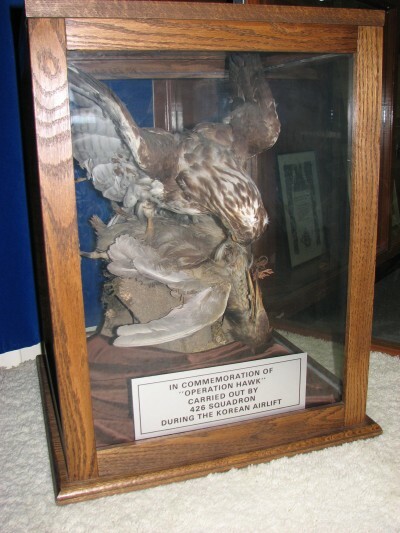 This Hawk was presented to 426 Squadron to commemorate Operation Hawk. It is displayed with the squadron Battle Honours, Dishforth Building, Trenton. Like a scene from Hollywood, Rose Thompson bids her husband LAC T.G.Thompson a fond farewell on his departure for the west coast. Since then the squadron has flown nearly 250 round trips between McChord and Japan, and has carried more than 6600 passengers including wounded. It has flown almost 2,700,000 pounds of cargo and has covered 2,759,000 nautical miles. The squadron has landed its aircraft at many points throughout the Pacific area, including Shemya, Adak, and Kodiak in the Aleutians, Anchorage in Alaska, Haneda, Misawa, Itami, and Ashiya in Japan, and at Wake Island, Johnston, Guam, Kwajalein, Hawaii, and San Francisco. For the first ten months of its airlift operations, 426 was based at McChord. Although continuing its airlift flights, the squadron moved back to its Dorval base in June. The squadron has been, and is, under the operational control of the United States Military Air Transport Service as far as its Korean airlift flights are concerned. The parade being held today in front of No. 6 hangar at Dorval is to note completion of one year of airlift operations by the Thunderbird Squadron. Not all squadron personnel are present. Absent are the aircrew out on trips between Dorval and Japan, as well as ground crew personnel who form servicing detachments at McChord, Shemya, and Haneda. Other aircrew are in the far Arctic, carrying out supply runs. Present are two veteran crews, drawn from USAF and RCAF personnel making some of the earliest flights on the airlift. Members of the American crew, who will be standing behind the American flag to the rear of of the saluting dais are 1st Lieutenant J.H. Hamilton, Captain R.A. Maculluum, Captain W.H. Smith, Technical Sergeant E.R. Bateman and Staff Sergeant M.W. Boyko. 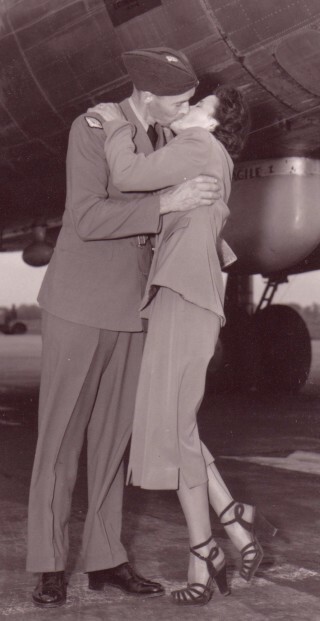 They were among the first American fliers to begin airlift operations. Members of the Canadian crew, who will be standing behind the Union Jack in the rear of the dais, are Squadron Leader J.D.Dickson of Hammond River, King's County N.B., Flying Officer D.H. Kuhn of Dartmouth N.S., Flight Lieutenant R.S. Reid of Toronto, Flight Lieutenant W. Smith of Montreal, Sergeant E.S. Barber of Carberry, Man. And Corporal E.C. Grose of Thorold, Ont. Most of the Canadian crew were aboard one of the first three 426 North Stars to leave McChord on July 27, 1950. During the greater part of its airlift operations 426 was under command of Wing Commander C.H. Mussels of Montreal, who relinquished command of the Thunderbieds last June to Wing Commander J.K. MacDonald, of Antigonish, N.S. 426 holds the airlift record for fastest time made on a round-trip including flight over the mid-Pacific route. This was set when one of the Thunderbird North Stars made the westward crossing by way of Elemendorf Field at Anchorage and Shemya in the Aleutians, returning via Wake Island and Hawaii,. Total elapsed time for the round trip was 71 hours and 30 minutes. Normal flying time ( actual time spent in the air) for this trip is about 62 hours. The first 426 North Star to begin the airlift operations was airborne from McChord at 7:45 PM. Pacific Daylight time, July 27, 1950. This aircraft was skippered by Squadron Leader J.H.C. Lewis of Vancouver, The next two North Stars left within 3 1/2 hours, at 9:15 PM and11:15 PM and were skippered by Squadron Leader J.D. Dickson of Hammond River, King's County N.B. And Squadron Leader A.J.P. Byford of Ottawa. Leading Aircraftsman H.R. MacDonald, Picton, N.S. S/L J.D. Dickson, Hammond River, King's County, N.B. Members of the Royal Air Force and the United States Air Force have served with 426 Squadron, under the officer exchange plan, during their operations. Flying with the squadron is F/L Arthur Knapper, of the R.A.F., who joined 426 shortly before the airlift began. F/L Knapper was formerly a member of the the famous King's Flight in the R.A.F. Major Thomas J. Upton of the USAF joined 426 a short time before the airlift started, and returned to the U.S. yesterday (July 26, 1951) a day before the Thunderbirds completed one year on the airlift. He has been replaced by Captain John Ralph of the USAF. A second RAF member F/L Robert Coates began the airlift with 426 and returned to the UK last April. One way distance from McChord to Haneda airport near Tokyo via the northern route is slightly more than 5000 statute miles. Distance by way of the southern or mid-Pacific route is 7325. Longest single hop on the northern route is between Shemya, in the Aleutians and Haneda, a distance of 2040 statute miles. Longest hop on the southern roue is between Hawaii and Travis Air Force base, near San Francisco. is 2400 statute miles. 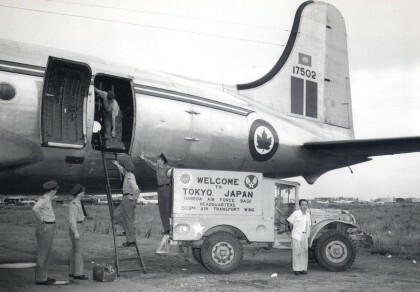 426 Squadron has carried a large number of wounded troops back from Japan. Such flights have been carried out by North Stars especially equipped to carry litter cases and which included flight nurses and medical assistants as crew members. When 426 Squadron left Dorval for McChord to begin the airlift operations, a new insignia took its place by the side of of the familiar maple leaf roundel. This was the blue and white United Nations insignia, which the North Stars engaged on the airlift still carry, painted on the tail fin. The North Star, which has gained new laurels on the Korean airlift, is a four engined transport manufactured by Canadair Ltd of Montreal, the firm that is making F-86 Sabre Jet fighters for the RCAF. In addition to the RCAF, the North Star is used by Trans-Canada Airlines, Canadian Pacific Airlines and British Overseas Airways Corporation. It is a low wing, all-metal monoplane, incorporating a tricycle landing gear. The North Star is powered by four Rolls Royce Merlin 622 engines, producing 1795 HP per engine. It has a wing span of 117 feet 6 inches, is 93 feet 5 inches long, and is 27 feet 6 inches from the ground to the tip of its tail fin.